Easy 30-Minute Mexican Casserole - tortilla chips, taco meat, beans, tomatoes and cheese - top with your favorite taco toppings! Can make ahead and freeze for later. Great kid-friendly mexican recipe!! I am always on the lookout for a great Mexican dish to make at home. I usually make enchillidas, so I was interested in making this casserole to change up our usual Mexican night. 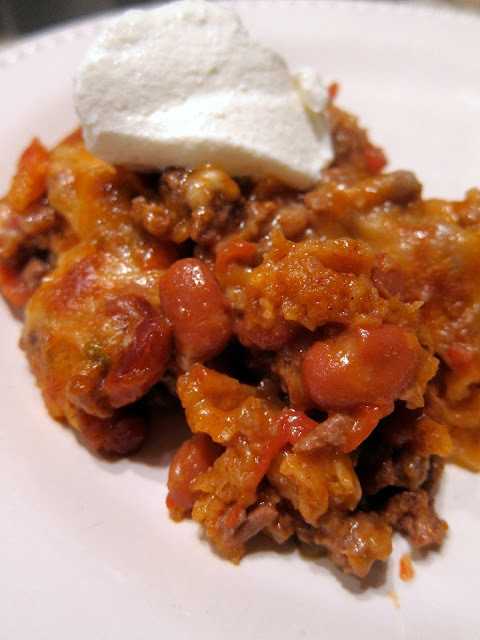 This casserole reminded me a lot of King Ranch Chicken but with ground beef. This was quick and easy to put together. I cooked my ground beef the night before and just mixed everything up when I got home from work. This is a very hearty and filling dish. It is also great reheated the next day. I think this would be a great dish to serve at a potluck dinner or even a tailgate party. Your Mexican Casserole certainly looks yummy! I have never tried cooking Mexican food before, this has really got me interested... ! Ohhh, I think I have everything to make this! I know what's for supper tonight! See, this is the kind of thing I luv. My hubby such a spoiled sport and doesn't go for casseroles. So, I'll just have to make it and have the Brother over to eat it with me and poor old hubby can drool and won't get any. found you through Amanda, I'm follower #213!! Can't wait to go back through your blog!! My children enjoy Mexican inspired dishes. I'll add this to the menu. This one looks DELICIOUS! I have a great one that I use that I'd be happy to share if you ever want to try another one, too. It's a huge hit at our house and reheats really well. Katherine - PLEASE share your recipe!! I love to try new recipes - keeps dinner from being boring. omg looks delicious. I just made a Mexican casserole with Hominy. It was wonderful, you'll have to watch for my post soon. we're so busy lately that these are exactly the type of simple dishes we need! thanks for posting! Love anything Mexican food related so this looks fantastic to me!! I love Mexican food - especially casseroles. This looks insanely good! OMG, I am not even sure how I stumbled across your blog but you have SO many tasty looking recipes! I made this one tonight and it was a hit! Can't wait to look around so more and try some others! Thanks! I am a new follower; everything looks soo good! Can't wait to try some of these recipes out! I made this last night for dinner. It looked exactly like the picture, was super easy to make and tasted great. TKS for the recipe. It might be a little messy (as casseroles tend to be) but dang this looks good, Steph! I love ranch style beans. I might steal this one and do it in cupcake tins to make individual sized servings. I have a question about this recipe, my mom will not eat anything that has anything to do with "chicken". So I'm wondering if there is another soup that you think could be substituted for the cream of chicken soup? Melissa - try cream of mushroom or cream of celery. Made this for dinner last night, another hit from Stephanie, Thanks! Cooking your sausage cheese grits this week on a all-girls trip to the beach, can't wait for that!! I made this last night. Like you, I only used about 6-8oz of crushed tortilla chips. I couldn't find ranch-style beans in my town, so used The Homesick Texan's recipe for them; nor could I find Ro-tel tomatoes, so subbed a can of diced and added a small can of chopped green chiles. Used my own homemade taco seasoning and an organic cream soup (no HFCS or other scary ingredients). We both liked this and DH was especially doing a happy dance. ☺ Thanks for sharing the recipe! I make this casserole all the time, been years, I have used crushed tortilla chips, but I like using corn torilla's in mine. Either way its quick, easy and delicious! Delicious! I just made this and added corn and used homemade taco seasoning. Also substituted half of the ground beef with ground turkey. So quick and easy! Thanks! Don't know if I should drain tomatoes and beans please advise. Ashdawnn@hotmail.com thanku!!! Thanks for the recipe! Also wondering if I should draint he tomatoes and beans? Don't drain the beans and rotel tomatoes - just dump them in there. Dinner tonight! Looks yummy...can't wait to taste it. BTW, what are "ranch style" beans? I just used black beans instead. Ranch Style Beans is a brand of beans - they are made in Texas and seasoned with southwestern spices. They are great in Mexican food and chili. Hi! Just curious if anyone has tried freezing this dish? I try to always double what I cook and freeze the extra for a later date. This dish was delicious straight from the oven... so hoping it would be the same out of the freezer. I used ground turkey meat and only 1/2 a can of cream of chicken, substituted greek yogurt for the rest. Also used Baked Tostitos all in an effort to make it a bit healthier without forsaking taste. It was really yummy, it passed the hubby test. Also used Ranch Style beans with jalapenos because we like it spicy! Thanks for the recipe, it is a keeper. I made this tonight and it was great! thanks! It's in the oven, can't wait! Thank you for sharing! This is a regular around my house. But we add a 1/2 lb of velveeta to ours and put the shredded cheese on top. :) My husband is a big fan of cheese. I also use Dorritos sometimes instead of tortilla chips :) Kids love it! In the oven now! This recipe was so easy to make. Can't wait to try it. Thank you for sharing. Made this tonight and it was a big hit. Great flavor. Awesome ....a definate keeper for the recipe book. HELP!! I have everything to make this recipe but what are "Ranch Style beans"? I didn't see any at the store. Donna C - Ranch Style Beans is a brand of beans. It says Ranch Style Beans on the can. If you can't find them, you can use some chili beans. This looks delicious! Trying it tomorrow for Football Sunday!! This is the best Mexican casserole ever! My husband likes taco salad, flautas, empanadas, etc, but hates "Mexican casseroles", which he claims are all variations on a theme. I've been trying "variations" for years to no avail! When I saw this recipe, I thought, this is the one! :D He happened to walk by while the beef mixture was in the skillet and said it smelled great and took a spoonful out of the pan. He loved it even before it was baked! Once it was baked, he loved it even more, and I've now made it twice in two weeks! It's just the perfect blend of ingredients and a very good flavor and good texture for picky casserole eaters! Love it! I made this last night (thanks to Pinterest) - very good! I used ranch style beans with jalapenos for added spice. For left overs I think I'll put this inside tortillas and serve burrito style. THANKS! This turned out pretty good, I used minced tomatoes rather than the Rotel, but it was darn good. I have made this one according to the recipe one time, but I have one child who doesn't like chips in dishes because they get soggy. The next time I left the chips out and just made it in a very large skillet I have and let the cheese melt on top. I then serve it with chips and we all love it. Just made this dish tonight :) It turned out pretty good but it wasn't what I was expecting. I think with a few tweeks, this would make a great party dip, too! Will this work in the crockpot? I make this with torn up corn tortillas instead of chips. Tastes the same, but lower in fat. I guess it would taste different if you used something flavored like Nacho Cheese Doritos instead of plain tortilla chips. I have also done a layer of tortillas with both corn and flour. It just depends on what I have in the house. I have also used cooked leftover turkey meat and grilled chicken instead of hamburger. Just tried this tonight for dinner. Can't believe I hadn't tried it before. I didn't have any tortilla chips and I didn't even think to use tortillas torn up (great idea) maybe next time. Anyway, it was yummy. My hubby and I both enjoyed it. Now to wrap it up to save for another day. What are ranch style beans?